Demand.Film will arrange a showing of the “Bikes of Wrath” documentary in Springfield Missouri if 46 tickets are sold. No one will be charged unless the minimum is met. I believe this is the second attempt to bring this movie to Springfield? The first showing, scheduled for March 25th, was cancelled because the minimum order was not met. If you are interested, please be sure to reserve tickets before Monday April 8th to help meet the minimum. If you arranged bringing the movie to Springfield, please let us know so we can add you as a co-host to manage this event. Loaded with trailers, musical instruments and camera equipment, the group set themselves the additional challenge of surviving on $420 (the modern-day equivalent of the Joads?? $18 in the 1930s) and whatever their musical performances can yield. 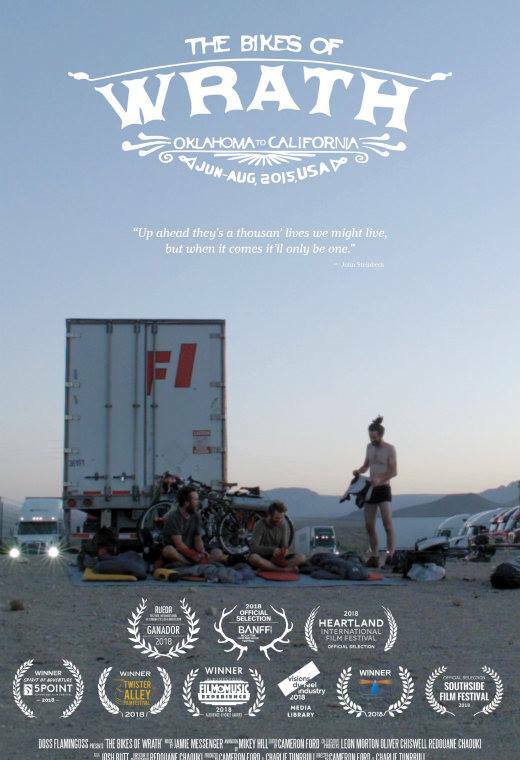 Letting the group into their homes, lives, and demonstrating the startling parallels of ‘The Grapes of Wrath’ seventy-eight years after its publication, these vastly different characters quickly become a central focus of the documentary, as well as integral to the success of the cyclists?? journey.